If rust, contaminants and stains are impacting a surface, often times the only way to thoroughly clean it involves a form of sandblasting. Sandblasting removes dirt, debris, paint, rust and most other surface contaminants to leave you with a clean surface ready to be coated or painted. Sandblasting is a cleaning method for a variety of surfaces including brick, stone, steel, concrete and so many others. Our services are provided typically for cooling towers, pipelines, pools, buildings, agricultural equipment, tanks, and more. For our sandblasting services please, call us at (717) 442-0979 so we can discuss the many ways our company can serve you. There are two main types of sandblasting: Dry Sandblasting and Wet Sandblasting. 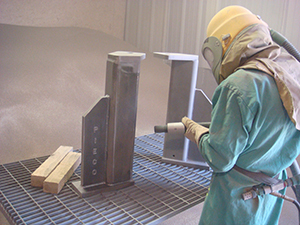 Dry Sandblasting is a process that uses a highly pressurized air stream combined with sand. This is typically used on metal surfaces to remove rust. After a thorough cleaning, the surface is ready to be treated with a fresh coat of paint. 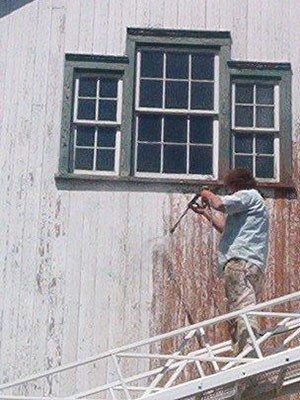 Wet Sandblasting is the most common means of stripping surfaces. The wet blasting process is very similar to dry sandblasting, however it uses a high-powered stream of water mixed with abrasives – in this case sand. The sand roughs the substrate surface allowing for better paint absorption. Both methods are very effective at removing surface contaminants. 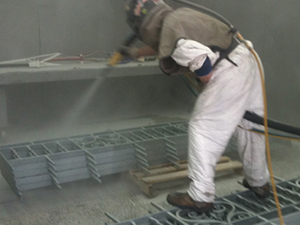 As a professional sandblasting company, we will be able to discuss the best method for your substrate. Call us today if you have a property that could benefit from our sandblasting services. The right tools, the necessary experience, appropriate safety protocol and the proper training are key to correctly sandblasting a surface. A professional contractor will have access to the tools that will not only get the job done faster, but get the job done in the safest manner possible. Sandblasting can cause harmful particles to become airborne if the correct precautions are not used. 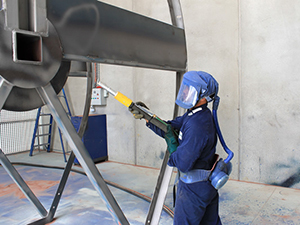 Let the dedicated team at Capital Coating, Inc. provide you with quality sandblasting services. Call us at today (717) 442-0979. We’ll show you why we are the leading sandblasting contractor for the state the Northeast.